Damara WA developed a low-cost 10-year Coastal Monitoring Action Plan for the Peron-Naturaliste (PNP) region to support decision-making for both active coastal management and adaptation for erosion and inundation risk mitigation by the nine local government authorities (LGAs). The nine LGAs are the City of Rockingham, Shire of Murray, City of Mandurah, Shire of Waroona, Shire of Harvey, Shire of Dardanup, City of Bunbury, Shire of Capel and the City of Busselton. The Plan addresses data collection needs to implement a targeted and meaningful monitoring program beaches and coastal systems of the PNP coastal region along approximately 210km of coastline. 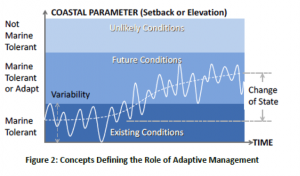 To support application at a local scale, the technical basis for coastal monitoring is presented, which may allow a LGA to comprehend the implications for decision-making if the monitoring program is varied. Recommendations are presented at the scale of tertiary sediment cells, typically for segments less than 10km length. Coastal Monitoring Action Plan (CMAP) – The technical basis for coastal monitoring in the PNP region and an outline of coastal monitoring activities recommended to be undertaken over the next 10 years. Coastal Database Report – A summary report describing a coastal database, developed from existing datasets and coastal monitoring programs along the PNP coast. The report considers the data coverage relative for erosion and inundation hazard decision-making. Coastal Monitoring Guidelines – Description of data collection requirements and methods for coastal monitoring outlined in the CMAP that can be undertaken by LGA officers. This project won the Award of Climate Adaptation at the 2016 Australian Coastal Awards. The judges noted the project represents an outstanding example of collaboration between coastal councils and provides an excellent example of how coastal adaptation could be addressed in other coastal regions.